Toads like to hide away in secret places where they can feel safe. In the garden you might find a toad hidden in a corner of a greenhouse, or under rubble and stones. They can puff themselves up to look bigger when they are threatened or feel scared. 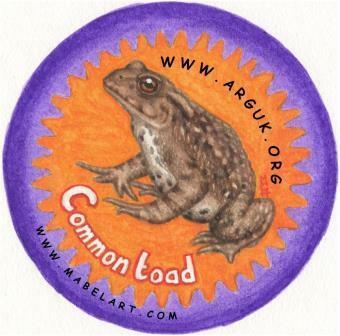 Toads like to eat woodlice, slugs, ants, beetles, caterpillars, flies and earthworms. Toads are normally solitary, but when spring comes in February and March, they will join with hundreds of other toads to migrate to ancestral breeding ponds, crossing anything in their path. Sometimes they cross busy roads, which is very unsafe, so dedicated toad patrollers collect them up in buckets to help them across. In the spring adult males grow special dark coloured patches on their first three fingers. These are called ‘nuptial pads’ and they help them to grip on to the female when they are mating. If they are disturbed, at this time males make a loud cheeping noise, to tell the other males to go away. Females produce long strings of spawn in jelly, unlike the clumps of eggs produced by frogs. These hatch into tiny black tadpoles in 10-14 days. Like adult toads, tadpoles can produce a nasty tasting toxin from glands in their skin which makes them distasteful to fish, so they can live alongside them in large deep ponds and lakes. Unlike common frogs, toad tadpoles remain black, and often shoal together, like fish. They grow their back legs first, and then front legs, with their tail disappearing last. After two or three months, young toadlets leave the ponds to go back into the countryside, hunting for insects, slugs and spiders. In some years they leave their ponds in a big mass, particularly when it is warm and damp after rain. On land toads can live in woodland and scrub, and are sometimes found in damp crevices in gardens, under compost bags, logs, compost heaps and even in buckets, plant pots and watering cans. In late autumn toads build up their energy reserves, ready to bury themselves in soft mud, or find a nice quiet spot under a log, rock or plant pot, or even in the corner of a greenhouse to spend the winter.